now the pub is closed, 60kph is really questionable.. it could really do with electronic signs, with faster limits after hours. Speeding, mid winter, through towns on the Buller run? Tell me more. MickM and mx_boarder like this. If Yarck folks can survive with 80k then Molesworth can too. Word is thats going to 60kph aswell. Yep heard that rumour in the Yea Chronicle. Anyone here get done a few weeks ago for speeding through Molesworth? It was a Saturday morning about 5am ish. I just heard that in a 2 hour period, approx. half the cars got caught, and about half of those were doing in excess of 30kph over the limit!!! One car was double the limit. 30kph over the limit is still only 90. They reduced Molesworth to 60 a couple of years back, and reduced the limit between Yea and Molesworth to 80kph while doing roadworks to install all those crazy barriers. To some degree, I accept that thought process. However, with the roadworks complete there now, and the Yea - Molesworth section returning to 100kph, it's really way overkill to maintain the 60 limit at Molesworth. Particularly so when every other town is 80. Lawdy lawdy, they want to reduce Yarck to 60 now too?! Good grief! I always feel like the bogan behind me is going to run me off the road when I slow down to 60 in Molesworth. Same bogan usually doesn't have enough grunt to overtake me on the hill before Yea!! 30kph over the limit is still only 90. I should have added that it was foggy at the time. 30kph over in fog is bloody stupid. Those “crazy barriers” saved a colleague’s life last week when he ran off the road to avoid a falling tree branch. Glad your colleague is OK . I understand the reasoning behind their installation. I’m sure there will be cases where the barriers are of benefit, cases where they’re not; pros and cons. I feel they’re debatable on a number of levels, nonetheless. skiflat and MickM like this. And next time it might save your own, I'm glad we have them. car, which corrected and kept on driving. Glad you made it djam. What is is with B trucks (drivers) tailgaiting motorists travelling at the speed limit. Trucking lobby delivers sermons about how truck drivers are regularly being cut off & sure this must happen. But a fair % of trucks I see on rural highways are within 2-4 car lengths of a vehicle. At 100 or 110 km/h they’ll never stop in time if a car hits the skids. Its madness and should be called out by all our Govt authorities. ...dont start me on Boges passing on all the crests/dbl lines!! For the first time in quite a few years, there will be no California and Colorado northern winter skiing for me next year. The wildflowers are only just beginning to bloom. This time last year there was a carpet of purple, but the snow covered the shrubs for longer this year. A couple of snow blowers have been dug up around summit chair. A bulldozer is down near the bottom of the chair. Jacko4650, Kenziepettit, MickM and 12 others like this. I should make a trip, still enough to slide on. MisterMxyzptlk, Seth, CarveMan and 1 other person like this. rime noreason, Whiteman, mx_boarder and 1 other person like this. MisterMxyzptlk, rime noreason, di6loc and 1 other person like this. MisterMxyzptlk, rime noreason, Edgecrusher and 3 others like this. You should try walking up Little Mt Buller if you're in the vicinity again, super easy 10-15 minutes up with sensational views! rime noreason, derwent, Jellybeans1000 and 5 others like this. Be interesting to see if there’s anything left by Targa weekend. Doubtful at this rate. mx_boarder and djam like this. That was the plan @CarveMan. We were almost there when Not Happy Jan refused to go any further, complaining that we still had the uphill slog back to Summit carpark Next time maybe the 4WD to the base of LBS. Or walk the Village circuit along standard and Whiskey Creek which I assume is not as steep as via LBS. There are still a few chairs lying around Blue Bullet top station. I was very tempted to have one fall in the boot of the car Similar to you wanting a specific chair for sentimental reasons @CarveMan, I’d have liked number 54 or 8. We have photos of our family and me riding for the first time on those two. @mx_boarder, plenty of snow as you can see from more photos below. the question you should be asking is... Should I pack the fat skis? Or should I pack the really fat skis? derwent, mx_boarder, DbSki and 4 others like this. I relish days out with the NHJ's, I haze them all day to instill in them the deep desire to never want to come anywhere with me again. For those up for Targa, you had fantastic weather. No ogling Targa cars for me this year. We got to admire Mt Buller from afar over the last few days instead. We made sure to time our trip up on Saturday between road closures, unlike a few others who had been oblivious and consequently stuck up there on Sunday. We planned to stay for a few extra days. We saw plenty of tyre marks on the Eildon-Jamieson road on the way home, as well as a full row of arrow signage around one corner that’s been a victim. I don’t even want to think about the carnage done to the vehicle! In gorgeous weather here too, we made the pilgrimage up to Mt Terrible again. The last time we did that, there was a deep carpet of snow. Now it’s a deep carpet of pink wildflowers. 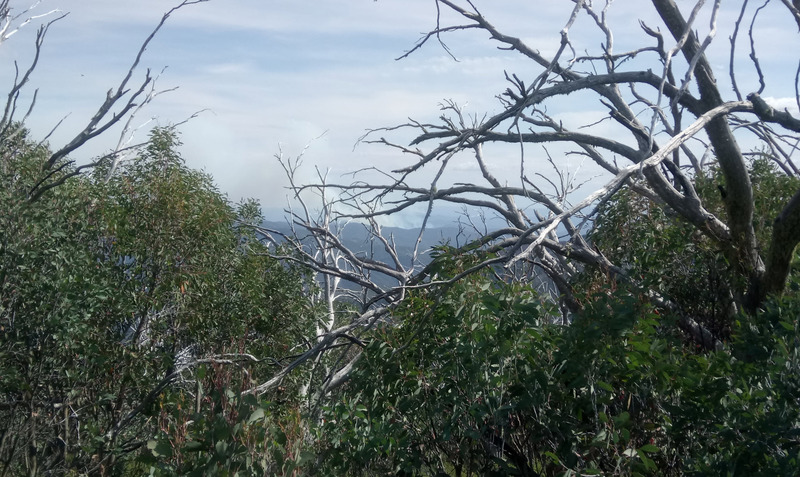 The hut is intact, the fire tower was manned, red bellied black snakes were working on their suntans. I like to think it was a couple of tiny patches of snow I could see still clinging on the summit of Mt Buller. djam, Whiteman, snowgum and 1 other person like this. This almost looks like a poster for Apocalypse Now! ...scary, we have an apocalypse emerging almost on our doorstep. I had "Ride of the Valkyries" playing in my head looking at those pics. And so you all have the complete set..
rime noreason and LiveToSki like this. @snowgum it’s formidable even from this distance so I can only imagine how apocalyptic it must feel surrounded by such a behemoth. Our courageous local fire fighters are currently there. Huge gratitude to them always. I hope they and all those in the area remain safe. @nezumi I wouldn’t be surprised if fire fighters frequently have this tune playing in their heads, too. @mx_boarder an immediate threat to our place at Enoch’s Point appears to have eased a little for now but Licola is a major concern. Those pictures are very ominous.Hopefully the wind will cause the fire to blow back over itself and keep the township safe. I suppose it’s impossible for human power to douse these fires, it’s a matter of protecting life and property while waiting for some heavy rains. Who knows when that will happen! LiveToSki and mx_boarder like this.